from lagalag, Adrian Ayalin’s blog. Lone Fatality. A wife, a mother, and three children â€“ all before the bag containing the body of Joel Tan, the lone fatality of three days of heavy rains in Dingalan brought by an active low pressure area. 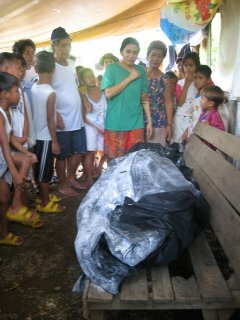 Joel drowned Wednesday January 25 after being swept by a strong river current towards Dingalan Bay. His body was found two days later, along a cove in a nearby barangay. At the time of the accident, Joel was carrying his nine-year old son Biboy. The kid miraculously survived after clinging onto a tree trunk. I’m doing a project for the Aurora Day celebration and Mrs. Mesina gave me a sackful of photos to be scanned. Here’s a couple of samples. This one looks like a procession in front of Baler Church. It was taken from the belltower of the church looking southeast. The street is the current San Luis St. and the area with a circular concrete is the front yard of the old municipio. This one is another picture taken from the belltower of the Baler Church. The street is the current Rizal St. and the basketball court is where the present MCC basketball court is still located. I’m guessing that these two picture were taken in the 1950’s. The project i’m doing by the way is a short documentary about DoÃ±a Aurora Aragon Quezon. If you have pictures or information that you can share, just email it to me at batangbaler at gmail dot com or post it at the comments area. Deadline is next week. from balita.ph: 1 missing, thousands displaced as flashfloods hit. from inq7.net: Aurora folk cope with life after tragedy. The floods came early this year. Here’s some snips from inq7.net. The italicized parts are my additions. The last flash flood that hit Casiguran was on December 27-28, 2005. Mayor Bitong of Casiguran said in a radio interview yesterday that this one is worse. He said that the cause of the frequent floods is the logging operation in the area. The Dicadi (Dinalungan-Casiguran-Dilasag) area is now isolated again and the roads are still unpassable. That Cabcab is Sitio Gabgab in Buhangin. Other areas affected in Baler were Brgy. Obligacion, some parts of Calabuanan, Brgy. Pingit, Sitio Kinalapan, Bognoyas (Buhangin-near the cemetery), Puduk and Binilwag (Monrio), Pulo (Zabali), some parts of Duungan (Burgos St. near TESDA) and Reserva. AV Mijares Elementary School was also flooded. A portion of the riprap wall in Kinalapan River also gave in and part of the overflow bridge in Dicaloyungan was damaged. San Isidro was heavily flooded – again. Other flooded areas in San Luis are Ditumabo and Real. A person was electrocuted in San Isidro. The Pantabangan-Canili Road is “hardly” passable. The Cabituculan area in Ma. Aurora was also flooded – for the first time. There were also reports of flooding in Dingalan. A person was also reported missing in Dingalan. After many chismis and fake news about a bus falling of a cliff somewhere in the Sierra Madre, it finally happened. A D’Liner bus rolled of a road in Ditailen, Ma. Aurora, Aurora yesterday morning after hitting a tricycle. There was no fatality but most of the passengers suffered broken bones, bumps, bruises, minor and major wounds. Passengers in critical conditions were airlifted to Cabanatuan. The accident happened around 8:45 am when the driver of the D’Liner bus on the way to Maria Aurora from Cabanatuan was managing a steep incline in Ditailen. The the driver tried to avoid a tricycle that cut into the bus lane. The tricycle was hit and the bus rolled over fell off a ravine the road. The tricycle driver is now in critical condition. Last January 3, there was a mistaken report that a D’Liner bus fell of the cliff along the Maria Aurora – Pantabangan road. Update: Here’s the ABS-CBN News online report. This pictureses are lying in the leftover bin of the BB server and need to be put to use. Part 4 of the Behind the Scenes series of the Best of Central Luzon coverage. October 2, 2005, Marilao, Bulacan. All these seats were taken. The Aurora media delegation. All three of them. The crowd. Third from left is Board Member Zeny Querijero.